He moved with his family to Wisconsin at age 4, and was raised in Neenah. From Oshkosh, he enlisted in Company G, 3rd Wisconsin Infantry on 20 April 1861. He was sick in Hospital at Frederick, MD and served as a nurse there from October 1861 - February 1862. He was wounded in action on 17 September 1862 at Antietam. After recovering (again in Frederick, MD, and in Philadelphia, PA) he returned to his in January 1863. He was again wounded in action, at Dallas, GA in May 1864. He mustered out on 29 June 1864 at the end of his term of service. He returned to Neenah, then attended Bryant & Stratton Commercial College in Milwaukee. He's listed as a brick maker in Neenah at the 1870 Federal Census. 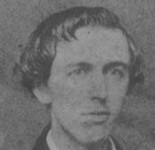 He studied Law and was admitted to the Bar at Green Bay in March 1873. From 1874 he was a "dealer in lands, proprietor of abstract office, real estate office and lawyer ... was elected Register of Deeds, at the organization of Lincoln County, in 1874, re-elected in 1876, 1878, and 1880" in Merrill, WI. Basic information from Bryant1. His gravesite is online from Findagrave. The quote above from his bio in History of Northern Wisconsin (1881). His wartime journals (edited by Steven S. Raab) were published as With the 3rd Wisconsin Badgers by Stackpole Books in 1999. Some details above from the Introduction in that volume. His photograph from one posted to Flickr by the Neenah Historical Society.